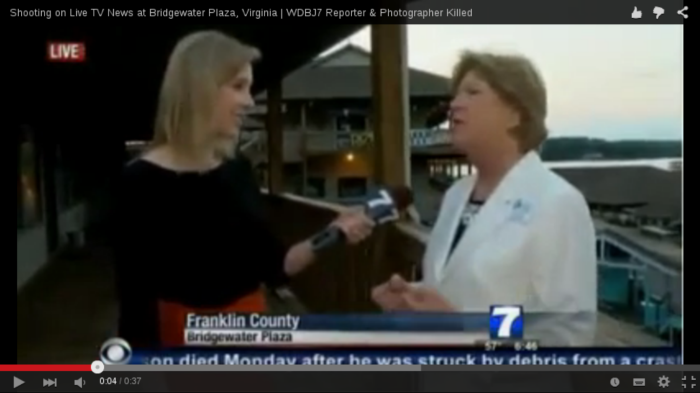 A disturbing video of a live TV coverage by news channel WDBJ7 has emerged. As the reporter begins to interview a woman live, shots can be heard in the background. The reporter starts screaming and the camera falls to the ground. The shot cuts back to the studio and the anchor is left speechless. "Okay, not sure what happened there. We will, of course, let you know as soon as we find out what those sounds were from," says the rattled anchor. The channel has confirmed the deaths of cameraperson Adam Ward (27) and reporter Alison Parker (24) at the Bridgewater Plaza in Virginia over a post on their website. "Law enforcement is on scene following an incident at Bridgewater Plaza. "The incident happened during a WDBJ7 live report. At 6:45am." - the post reads.